Working on an exquisite recipe but forgot a single ingredient and want to check it on the internet? You might not want to touch the keyboard as your hands are dirty. Why don’t you let your computer do it for you? All you need to do is speak out “Hey Siri” followed by your query? Siri is an intelligent personal assistant that uses voice commands to answer questions and carry out various smartphone tasks. This feature has been on iPhone and iPad since forever. But after the release of Mac OS Sierra, it has been included in Mac as well. Unfortunately, voice activation is not enabled by default. 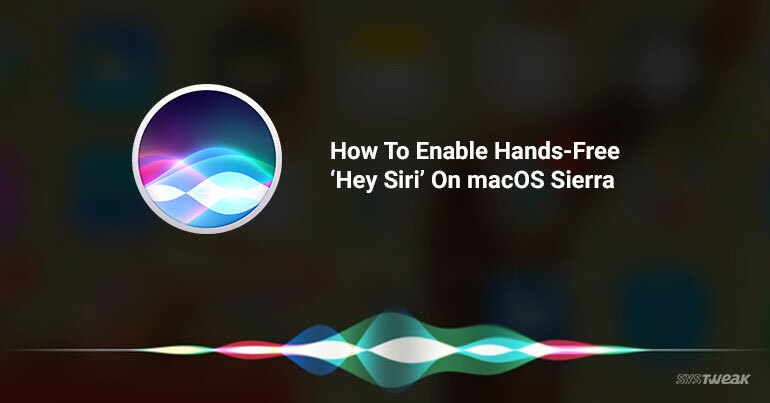 In this article, we’re going to discuss how to enable hands-free “Hey Siri” voice activation on Mac OS Sierra. It is necessary to enable dictation to make sure your system work on your voice activation. Step 1: Go to ‘Apple icon’. Step 2: Choose ‘System Preferences’. Step 3: Open ‘Keyboards’ from the ‘System Preferences’. Step 4: Click ‘Dictation’ tab. Step 5: Select the ‘On’ button beside Dictation. Step 1: Go to Apple icon located at the upper left corner of your computer screen. Step 2: Click “System Preferences” from the drop-down list. Step 3: On System Preferences window, click Accessibility and then scroll down to select Dictation. Step 4: Check-mark “Enable the dictation keyword phrase” and enter “Hey” in the text field. Step 5: Check Enable advanced commands. Step 6: Now, click “Dictation Commands” and choose the (+) button on the left of the pane to add a new command. Step 8: First select “Open Finder Items” besides ‘Perform’ and then open your Applications folder, and look for Siri app. Step 9: Select “Siri.App”, and hit ‘Done’. Now, you’re all set to use voice activation on your Mac, all you need to do is say “Hey Siri “and it will invoke Siri quickly. Of course, you can change the command such as “Hey Computer” or “Hey Mac” to make sure you won’t run any other gadget with your Mac. Do not forget to share your handsfree experience in the comment section below.